As a follow-up to yesterday’s post “The little things I miss about the States…” I made a short list of the little things I do not miss about the States. 1. Needing a car to access outdoor recreation. The States boasts some pretty amazing outdoor experiences–from the Appalachian trail to the Pacific coast–but most of these protected lands require a car to get there, making them exclusive experiences. We do not have a car in Switzerland and frankly we don’t need one. 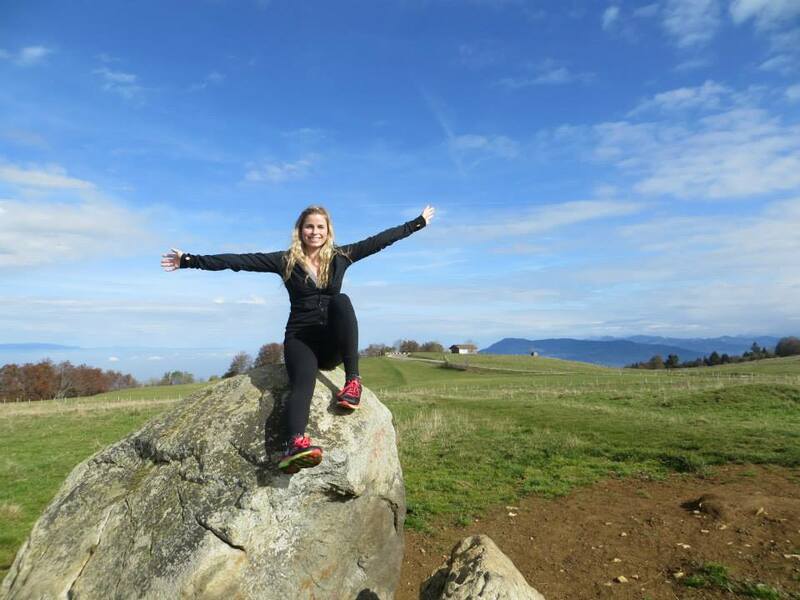 The busses and trains take us right to the Alps and hiking trails we desire to visit. (Which is why it is common to see a person in full ski or hiking gear riding a public bus in downtown Geneva.) How incredible would it be if every American child had that kind of access to our national parks? I took the bus that goes by my apartment to this spot. 2. The open container law. I believe one of life’s greatest pleasures is eating outdoors, preferably with a glass of wine–but legally, I’m not allowed to do that on a picnic that is not occurring on my own property in the States. I think this U.S. law is outdated and a cultural holdover from the Prohibition Era. Did you know that the U.S. is in the minority when it comes to its open container law? Most of Europe, including Switzerland, allow adults to drink anywhere–and I promise it isn’t like New Orleans’ Mardi Gras every day. 3. Having to tote your own bottled water. With Évian-les-Bains just around the corner (yes, where that fancy water comes from), Geneva is easily able to supply its public drinking fountains with clean water. And these drinking fountains are everywhere! They are designed so that people of all heights can take a sip, fill their water bottles or even allow their dogs to lap up some water. One is never far from free, clean water which makes people more likely to drink it. I also assume that this cuts down on the plastic bottle industry and all the accompanying environmental effects. 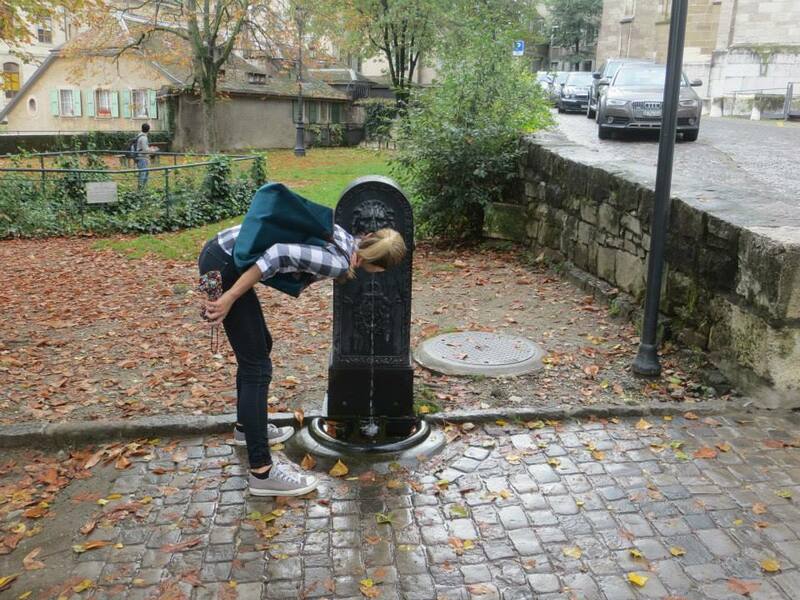 Taking a sip from one such fountain like the real Swiss do. 4. 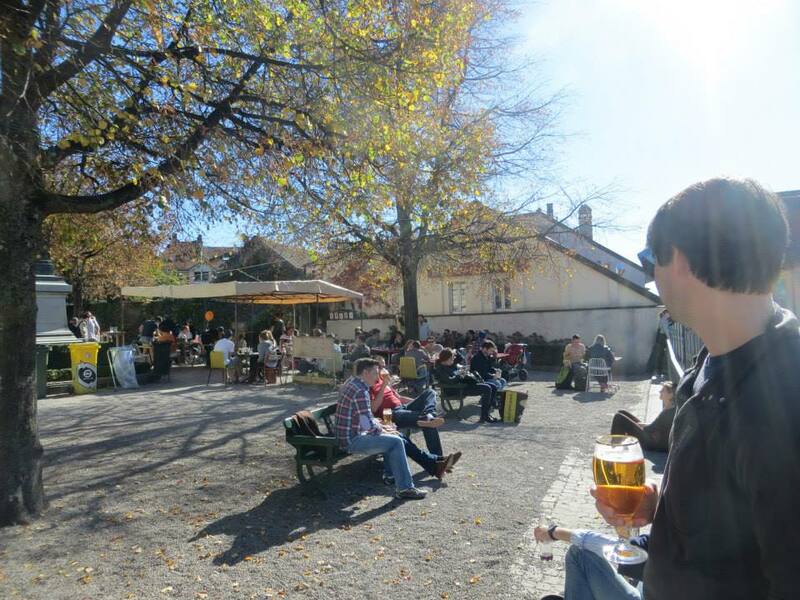 Calculating the tax, tip, etc… Prices are as stated in Switzerland. If you have a five franc coin in your pocket and you want to buy a five franc ice cream cone, perfect. None of this trying to calculate taxes or understand what the asterisk on the end of a $1.99* hamburger means. Switzerland doesn’t even have one cent coins. Prices are in whole, round numbers. As far as tipping, one to two francs is generally considered an extra nicety. Maybe more if it was an extravagant meal or the service was exceptional. No need to figure out what 18.5% of your dinner was. Tipping anything extra than the stated price is just that–extra. Ciao! A bientôt! Bis spöter!